I think we all very well know the quote, “Florals for spring? Groundbreaking.” But let’s be real for a second Miranda Priestly – florals are probably THE biggest bonus of spring and summer clothing. With the turn of the equinox and buds sprouting, I love matching my environment in floral-printed everything. While the style itself is not groundbreaking, I find that the unique designs and patterns that bring the environment to life on clothing is quiet beautiful. 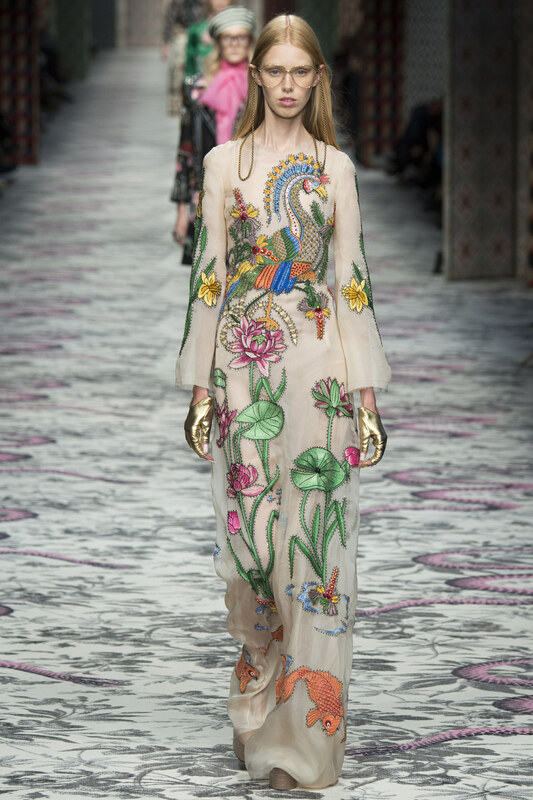 Be it Gucci’s embroidered gardens or Alexander McQueen’s fantasy forest, spring trends always deliver. My Nicholas off the shoulder dress delivers this same eye-catching effect. It’s a bit of Trompe-l’œil meets impeccable fashion design. I love the ruffle aspects of the dress, it’s cut out details, and the black and white floral print. 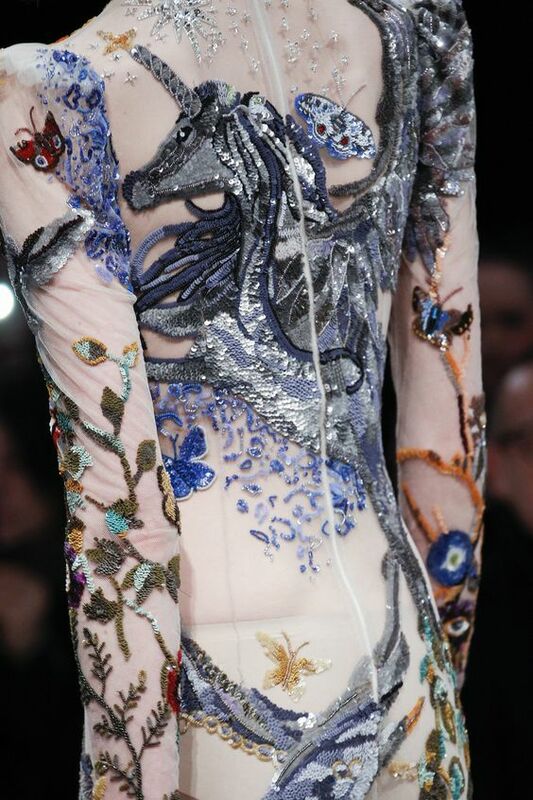 My absolute favorite thing about fashion design is how the attention to detail makes the dress. When you add all of these subtle elements to a piece, it really shows how far the designer pushed the boundaries on a subject so simple as a floral print or general off-the-shoulder look. 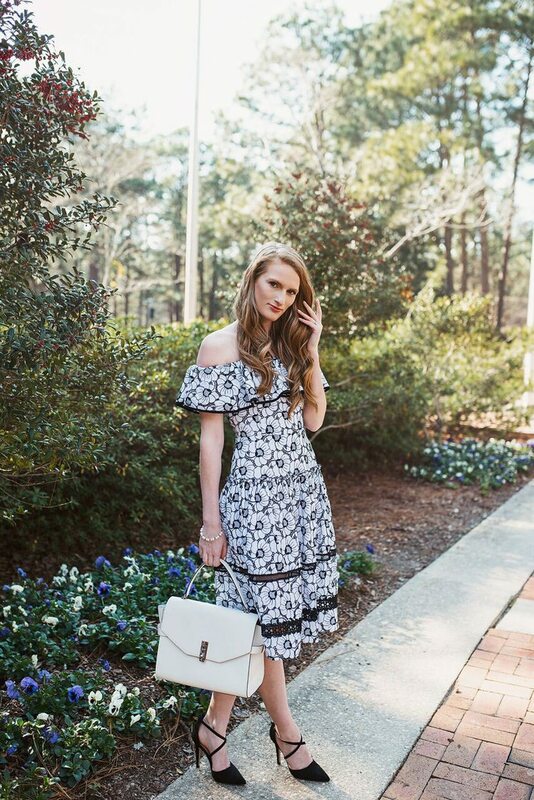 I paired this black and white dress with some minimal accessories, like my favorite Alex & Ani bracelet, my structured Henri Bendel bag, and my strappy Forever21 heels. I hope you are all enjoying this lovely spring weather, and more importantly the spring fashion that comes with it 🙂 Spring/Summer happens to be my favorite season of fashion because of the aesthetics and ethereal charm of all of the clothing. 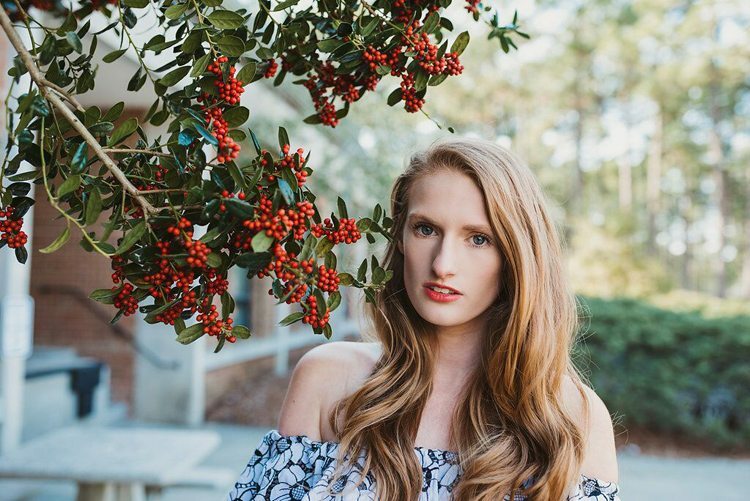 Just stay tuned for more pretty dresses and floral fun, I guarantee you won’t want to miss out! Shop my entire look by scrolling down to the bottom of this post! Tell me in the comments below, what’s your favorite spring trend? You look absolutely stunning!! Love your off shoulder floral dress!! Lovely Photos! O M G! that dress is so flattering on you! that fit is P E R F E C T! have you had it made for you? Such a pretty dress! I love it girl. You look flawless and that bag is so chic. 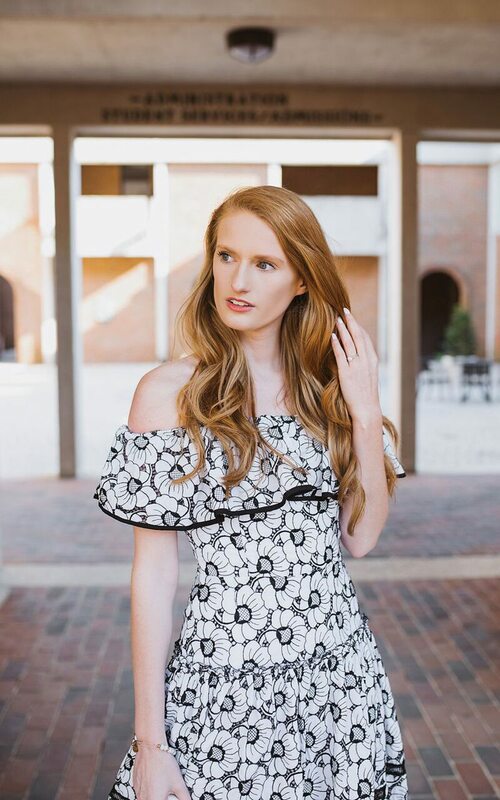 The black and white details on this dress really translate well with what you said about the fact that florals can be boring, but when they are unique they can be styled perfectly. You did a great job with this one. You look so cute! Loving the dress! Oh, this is so super cute!! Love it!! This dress is amazing! Proof that even in black and white, florals are stunning! Beautiful photos too! I can’t get enough of these pictures! You look so stunning! Lovely dress! Looks so elegant! I just did a post on my favorite Spring Trends – definitely would have to say super oversized accessories! 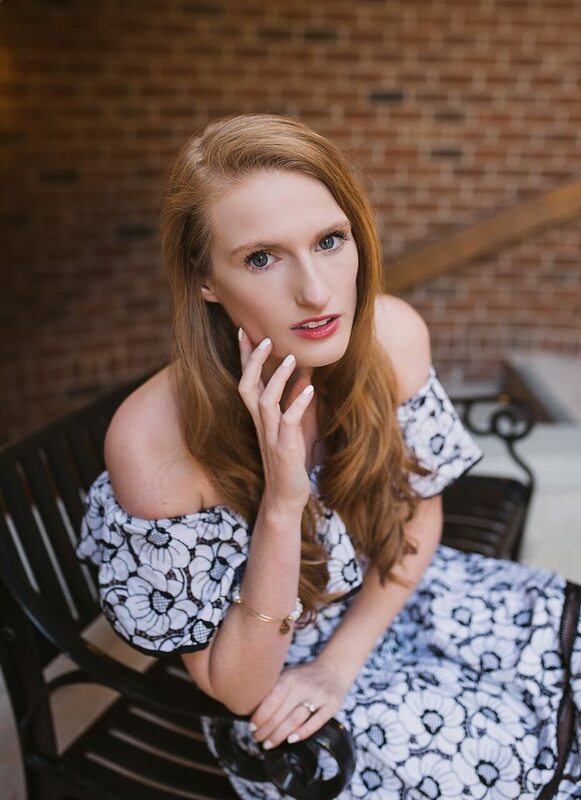 Your photos are gorgeous, so is this dress and always always love a Miranda reference! xoxo! You should be a model! Absolutely gorgeous and I love that dress!! Looking gorgeous!! Love your dress…so classy! Can’t get enough of that dress- it’s so perfectly girly! SSuchSuch a pretty dress I love the print. Styled to perfection as always. And I love the movie The Devil Wears Prada, I can quote the entire thing so I laughed at the Miranda Priestly reference! Loveee yoir dress & you look great ? Thank you Kara, you’re so sweet! i just love this beautiful spring look on you. The dress and bag combo is really great. Your red hair adds just the right amount of color. Enjoy looking wonderful this spring. What a beautiful dress, I love the off the shoulder / ruffle combination! Thank you! This dress is so fun and it fits me perfectly! Lovely post! Your heels are so elegant! Obsessed with that print! That dress was made for you! I’m going to need that dress and bag ASAP! Oh my goodness, you look like a model in all of these shots -gorgeous!! I’m all about florals and that dress is absolutely breathtaking! That floral pattern is stunning!!! I love it, so gorgeous for spring! I love every single thing! That floral, that classy bag, those gorgeous shoes! This dress is absolutely darling! 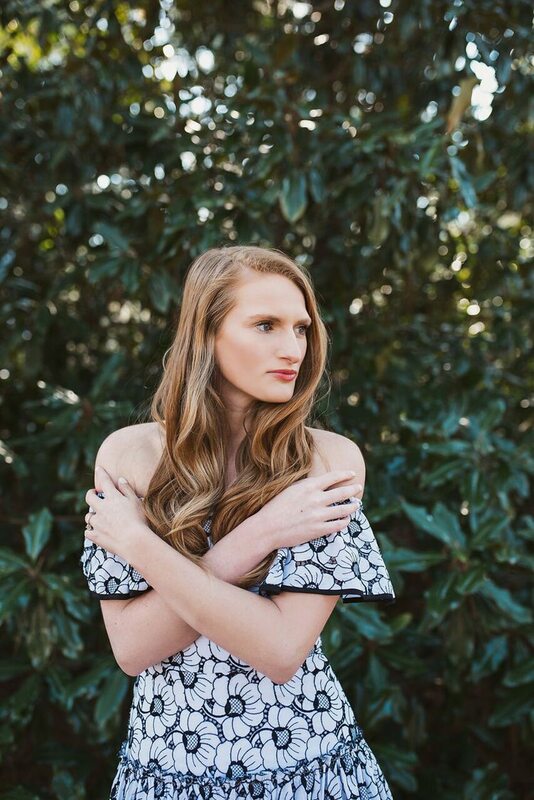 The print is so much fun and the ruffled off-shoulder is so elegant. I love that chic bag paired with it! 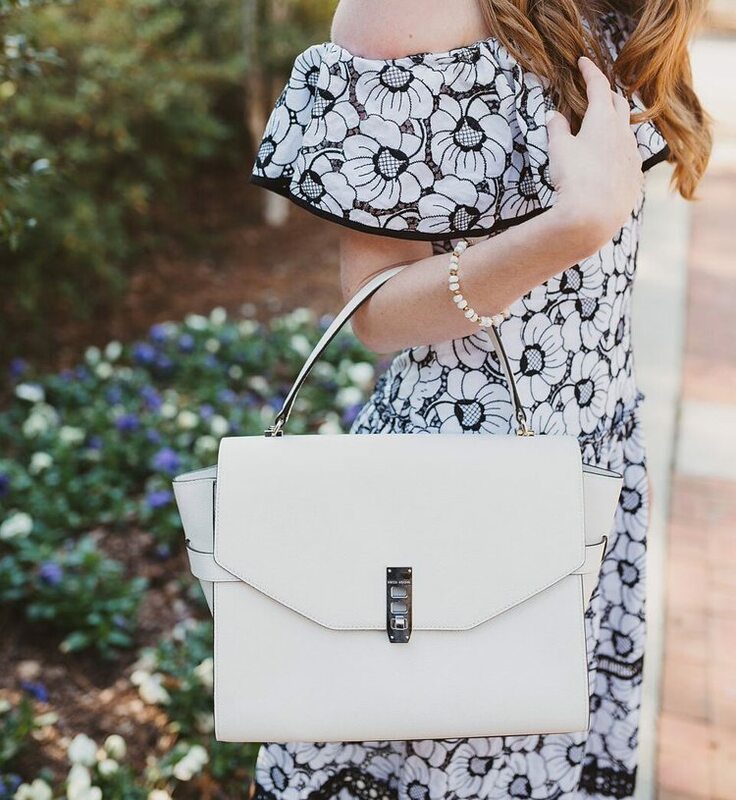 This black and white dress is SO chic babe! I’m loving ruffles this spring!! I’m obsessed with florals during the spring and summer. It really had more flare to the outfit. I love this outfit!! This dress is SO gorgeous! 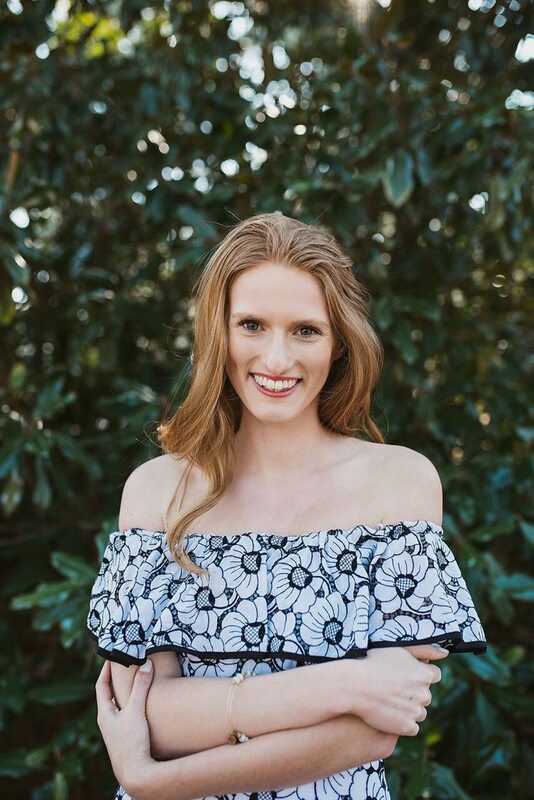 Florals + off the shoulder = perfection!!! Such a gorgeous outfit! You look lovely! This is such a pretty dress and your hair looks GORG! omg this dress is gorg! and your photos are so beautiful!!! That dress is BEAUTIFUL! I love the pattern and black and white! 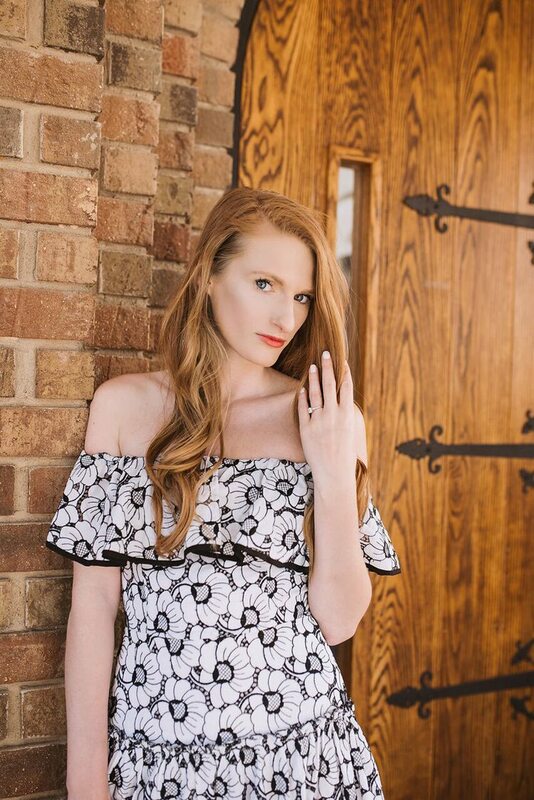 Such a gorgeous spring dress, black and white florals are always such a classic choice! that’s the prettiest dress! and i love your hair! This dress is amazing, Taylor! You look fabulous! I am a big fan of tweed this spring which is about as groundbreaking as florals, haha! Also seem to be loving anything blue as I’ve bought a ton of it! Love this on you lady! You are beautiful! I love everything about this dress. 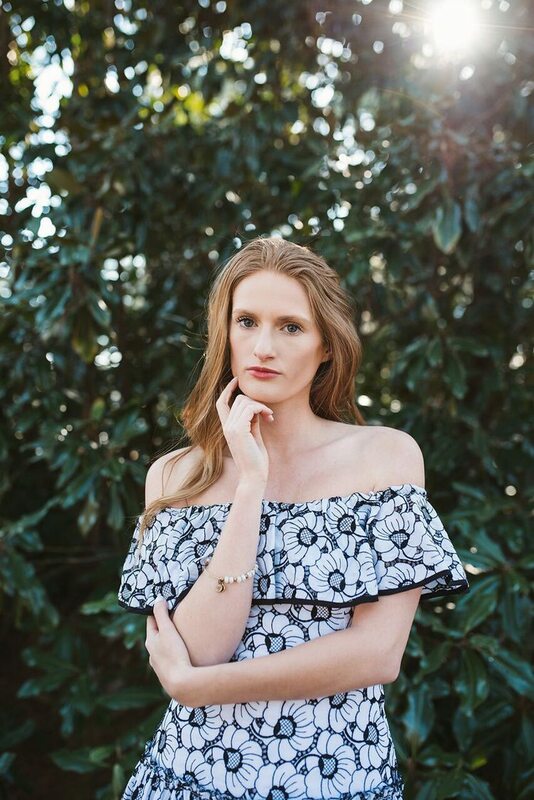 The off the shoulder silhouette, the fabric, the chic black and white combo…. It’s just perfect! That dress is just adorable! I love that it’s off-the-shoulder. And that black and white floral fabric is to die for! Wow, marvelous blog format! How lengthy have you ever been blogging for? you make running a blog glance easy. The whole glance of your web site is maciefignnt, let alone the content material!